As President Emmanuel Macron of France accepts Mr Orbán’s identification of him as his main adversary in Europe, a pro-government analyst explains that the two leaders are in fact the leading personalities of two opposing camps in Europe. In Magyar Hírlap, Gergely Berzi, the Director of Foreign Affairs of the pro-government Századvég think tank suggests that Mr Macron and Mr Orbán are the main protagonists of the confrontation mentioned by the French President. Mr Macron is in fact the leader of the pro-immigration camp, he explains, as Chancellor Merkel of Germany has been severely weakened by the evident failure of her open doors policy and has taken a less pro-immigration stance. Reacting to a meeting between Italian Interior Minister Matteo Salvini and PM Viktor Orbán of Hungary, Mr Macron said ‘if they wanted to see me as their main opponent, they were right to do so’. At a press conference after the meeting with Mr Salvini in Milan, Mr Orbán identified in President Macron the leader of what he called the pro-immigration forces in Europe Mr Macron swiftly replied that ‘a strong opposition is building up between nationalists and progressives and I will yield nothing to nationalists’. In Népszava, left-wing sociologist Pál Tamás thinks both the supporters and the critics of the planned ban on gender studies courses profoundly misunderstand the nature of the conflict. Universities produce an unprecedented number of MA and PhD graduates who find it increasingly difficult to find jobs in higher education. Most of them are women, while leading posts are still typically occupied by (elderly) men. Gender studies on the other hand, is a field overwhelmingly dominated by women and is therefore an important channel for academic careers for the ‘female academic workforce’, the sociologist writes. He compares the current conflict to the elimination of social anthropology classes in 2016. The reason was that they were becoming increasingly popular, while traditional ethnography classes attracted fewer and fewer students. On that occasion, ethnography professors proved more influential. Tamás thinks something similar must be happening around gender studies: ‘inter-academy scuffles, rather than the views of the Prime Minister, should be sought in the background’, he writes. Growing or increasingly popular courses ‘are usually under attack from their competitors’. In Népszava, György Sebes finds it sad that the government uses symbolic politics to boost its popularity. 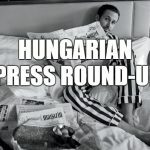 The left-wing columnist thinks that the government’s earlier ban on symbols of totalitarian regimes, taken together with its decision to display banners decorated with a cross on August 20, signal an attempt by the government to design and impose a new system of values and symbols which every Hungarian must follow. Heti Világgazdaság’s András Hont accuses the government of hypocrisy. The liberal commentator suggests that while the government claims that it defends Christian values, in reality it violates the basic norms of Christianity. As an example, Hont mentions the government’s policies towards migrants, noting that the authorities no longer offer food to those migrants in the transit zones on the Serbian border whose asylum application have already been rejected. Hont also mentions that the government has supported the Kurultáj events which celebrates the putatively common pagan and nomadic heritage of eastern Turkic peoples and Hungarians. Hont finds it controversial that the government wants to defend Christian Europe and Hungary from mostly Muslim migrants, but at the same time, celebrates the common heritage of Hungarians and pagan nomadic peoples. Tamás Pilhál in Pesti Srácok contends that liberals are suffering from a phobia towards national symbols. The (tiny) Liberal Party in a press release wrote that the display of the flag with the cross on the Parliament building is abhorrent, reminiscent of the interwar anti-Semitic Imrédy government’s practice, which defended discriminatory anti-Jewish legislation with the pretext of the defence of Christian and national values. Pilhál finds it peculiar that despite their constant fear of Christian symbolism, left-wing and liberal intellectuals like to refer to Christian values when they criticize the government’s immigration policies. Magyar Idők’s Zsolt Bayer calls the Left’s outrage over the flag a joke. The pro-government columnist thinks it absurd to suggest that Christian churches have any political power in Hungary. Bayer claims that the display of the flag with the cross is a ‘revolutionary act’ against the anti-national and anti-religious cosmopolitan Zeitgeist. Bayer goes so far as to suggest that critics of the flag want to destroy all traditions and identities and turn people into ‘liberal, gender-aware consumer zombies’. Pro-immigration critics of the Christian symbol have more affinity towards Muslim symbols than traditional Christian and Jewish ones, he claims. On August 20, the government for the first time decorated the Parliament building with Christian cross flags reminiscent of the banners of St. Stephen, but onto which white crosses had been superimposed. The cabinet office of the Prime Minister said that the flags were displayed in accordance with the spirit of Hungary’s Fundamental Law which describes the protection of Christian values as important for the State.